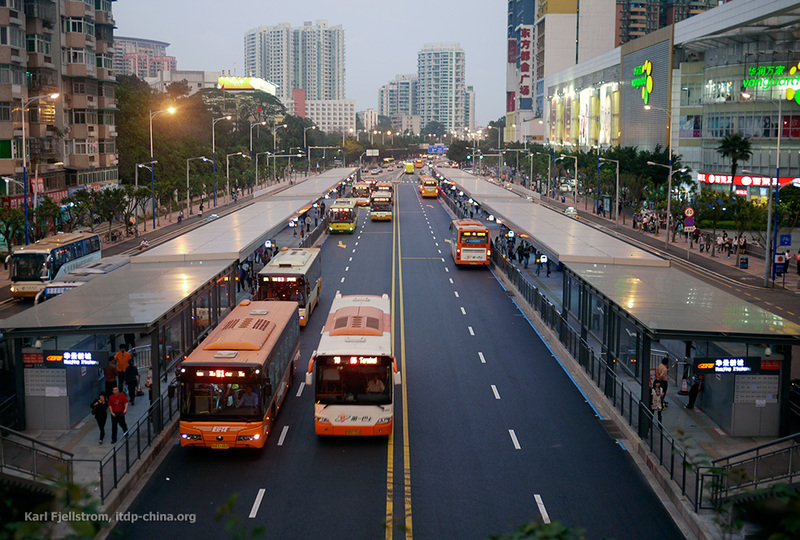 The recently launched Guangzhou BRT is expected to change public perception about bus-based travel around the world. Photo: Karl Fjellstrom, ITDP. In the past several weeks, we’ve covered some ground-breaking bus rapid transit (BRT) systems on TheCityFix, including Ahmedabad’s Janmarg, the first full-featured BRT in India, and Johannesburg’s Rea Vaya, which will eventually be the first full-featured BRT in Africa. 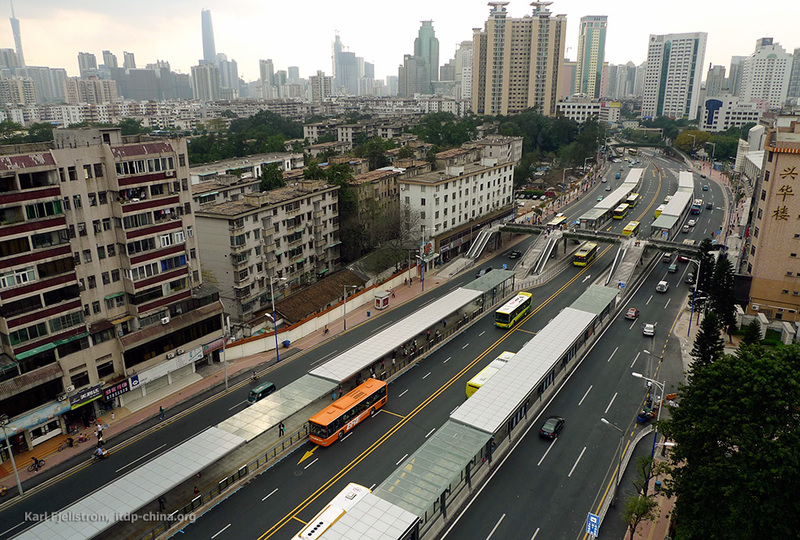 The newest of these pioneering transit systems recently opened in China – the Guangzhou BRT, known as GBRT. After a ten-day test run over the Chinese New Year holiday, the 22.5-kilometer system launched on February 21. The GBRT is a system of superlatives, like so many other things are in China: it has the world’s highest number of passenger boardings at BRT stations, the highest BRT bus frequency, and the longest BRT stations. What’s more, it is the first BRT to directly connect to a metro system and the first BRT system in China to include bike parking in its station design. In its first month of operation, the GBRT’s ridership levels are second only to Bogotá’s Transmilenio, with more than 25,000 passengers per hour in a single direction at rush hour,and more than 800,000 boardings per day. GBRT is noteworthy for its provision of “direct service.” This takes advantage of the ability of buses to operate both inside and outside a BRT corridor, greatly reducing passenger transfers compared to a trunk-and-feeder system. Experts also point to good corridor selection and station design (in terms of dimensions, placement, architecture and configuration). Additionally, Guangzhou takes a novel approach to bus operations. All of the other Chinese BRT systems have one BRT operator, typically the dominant state-owned bus operator. In Guangzhou, there are seven operating companies in three large corporate groups. This makes some aspects of regulation more complicated, but ultimately, gives regulators more options in terms of ensuring good service. GBRT’s launch was not without challenges. The media coverage was hostile prior to the opening. The system was also plagued with a few operational problems later in February as demand returned to normal levels after the Chinese New Year holiday. However, the media now reflects generally positive views, and officials are working to further improve the system in the coming months. Currently, it relies on some regular urban buses, which are unable to meet the high demand. The city is now procuring new 18-meter BRT buses to add to those already in operation. Additionally, planners are working on BRT route adjustments, with technical input from the Institute for Transportation and Development Policy (ITDP) and a public consultation process. Minor route changes, combined with the phased introduction of express routes and larger buses, will result in dramatic operational improvements even as passenger demand continues to grow. Shidajida Station. Some GBRT stations see more passenger boardings per day than many BRTs achieve system-wide. Photo: Karl Fjellstrom, ITDP. So far, GBRT’s achievements are impressive. The system is already thought of as a top contender for next year’s Sustainable Transport Award (Ahmedabad’s Janmarg took home this year’s top honor.) What’s more, it is expected to have impacts around the world. Fjellstrom points out that local support for the system is also strong. All of the key provincial and city level officials have ridden and endorsed it, and there is still a regular line of people along the pedestrian bridges who come to watch it in operation. In a sense, Fjellstrom observes, GBRT has created a million new bus rapid transit experts. Check out this GBRT photo gallery. And if you’re visiting Guangzhou anytime soon, this blog posted some handy users’ tips.